Vice President Mike Pence, chairman of the recently re-established National Space Council, toured the Kennedy Space Center Thursday and vowed to renew American leadership on the high frontier, telling spaceport workers "our nation will return to the moon, and we will put American boots on the face of Mars." Speaking to a throng of spaceport workers inside the cavernous Vehicle Assembly Building where Saturn 5 moon rockets and space shuttles were once put together -- and where NASA's gargantuan Space Launch System rockets will be assembled -- Pence provided no details about the Trump administration's space policy or what changes might be in the offing. But as the chairman of the re-formed National Space Council, the vice president promised that under President Donald Trump, "America will lead in space once again." "For nearly 25 years, our government's commitment seems to have not matched the spirit of the American people," he said. "But I'm here to tell you, that as we still enter this new century, we will beat back any disadvantage that our lack of attention has placed, and American will once again lead in space for the benefit and security of all of our people and all of the world." Positioned directly behind the podium were a SpaceX Dragon capsule, a Boeing CST-100 spacecraft -- both being commercially developed to ferry astronauts to and from the International Space Station -- and NASA's Orion capsule, being built to carry astronauts beyond low-Earth orbit and on to the moon or Mars. The Boeing and SpaceX ferry ships are expected to make their first piloted test flights next year while the first flight of the new SLS booster and an unpiloted Orion capsule is scheduled for 2019. The first crewed flight of the Orion/SLS system is targeted for the 2021 timeframe. 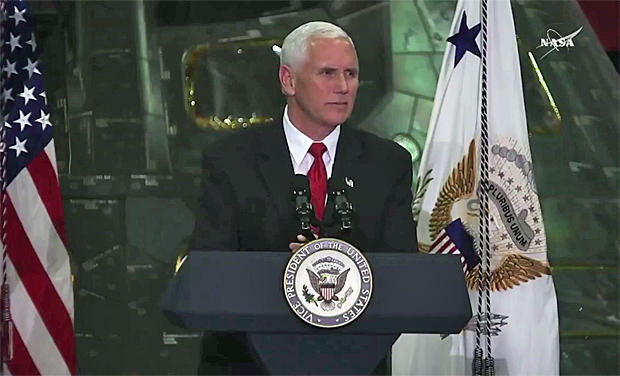 Speaking in general terms with frequent references and praise for the president, Pence seemed to re-emphasize NASA's current goals, saying "we will re-orient America's space program toward human space exploration and discovery for the benefit of the American people and all of the world." "We will return our nation to the moon, we will go to Mars and we will still go farther to places that our children's children can only imagine," he said. "We will maintain a constant presence in low-Earth orbit and we'll develop policies that will carry human space exploration across our solar system. As the president has said, space is, in his words, the next great American frontier." "We'll review our current policy and our long-range goals and coordinate national space activities from national security to commerce to exploration and beyond," he said. "And crucially, at the president's direction, we will, in his words, foster close coordination, cooperation, technology and information exchange among all the stake holders and sectors involved in space activity." That includes government agencies, the military and "leaders from the realms of private industry and the academic world. We will bring the best of America together once again to lead with Americans in space." Current U.S. national space policy evolved in the wake of the 2003 shuttle Columbia disaster and President George Bush's decision in 2004 to complete the International Space Station and retire the space shuttle by the end of the decade and develop new rockets and spacecraft to carry astronauts back to the moon by the early 2020s for long-duration stays. The Obama administration concluded the resulting Constellation moon program was not affordable and ordered a major change of course. The Orion spacecraft developed for the Constellation program was retained and NASA eventually won approval to design the heavy lift SLS booster. But the moon was taken off the table in favor of a more nebulous "flexible path" strategy that called for visiting an asteroid in the mid 2020s before eventual flights to the vicinity of Mars in the mid 2030s. President Trump canceled the asteroid retrieval mission that was a centerpiece of the Obama administration's policy and NASA managers have been quietly studying plans for a base of some sort in lunar orbit that could serve as a jumping off point for eventual deep space missions. But the Trump administration has not yet articulated a detailed space policy or named a NASA administrator to replace Charles Bolden, a former shuttle commander who led the agency during the Obama era. But during a White House ceremony June 30, Trump signed an executive order re-establishing the National Space Council, a panel of civilian and military leaders responsible for coordinating civil, military and commercial space policies and programs. "The National Space Council will be a central hub guiding space policy within the administration," Trump said. "And I will draw on it for advice and information and recommendations for action. And the Vice President, myself, and a few others are going to pick some private people to be on the board. ... Some of the most successful people in the world want to be on this board." Chaired by Pence, the council will include the secretaries of State, Defense, Commerce, Homeland Security and Transportation, along with the director of the Office of Management and Budget, the director of the White House Science and Technology Policy office, the director of National Intelligence and the chairman of the Joint Chiefs of Staff. The yet-to-be-named administrator of NASA also will be on the panel, along with other senior government and industry leaders. John Logsdon, a noted space historian, author and space policy analyst, said the National Space Council has had a checkered on-again, off-again history. The National Aeronautics and Space Council was established by Congress in the act that created NASA in 1958. Originally chaired by the president, it was intended to coordinate civilian space projects and national security space initiatives. President John F. Kennedy made his vice president, Lyndon Johnson, the chairman of the panel. Logsdon credited the council with playing a key role in Kennedy's decision to send astronauts to the moon in what became the Apollo program. The council fell into disuse after Kennedy's assassination when subsequent vice presidents Hubert Humphrey and Spiro Agnew expressed little interest in space. President Richard Nixon ultimately did away with the council in 1973. But congressional interest revived it toward the end of the Reagan administration and President George H.W. Bush brought the new panel into being under the leadership of Vice President Dan Quayle. Logsdon said the National Space Council played an initially strong role, but the panel was eliminated by President Bill Clinton in a broader move to cut costs across the executive branch. The National Space Council, Logsdon said, has a "mixed record, and it totally depends on how the president relates to the vice president and how the vice president chooses to use his limited influence, whether he makes this an area of priority for him, which Humphrey and Agnew did not, Bush-Quayle did. You can't really predict." As for what Pence and the council might do in the near term, Logsdon cautioned not to expect any immediate changes in direction. "Obama came in in '09 having been warned by his transition team that there were problems with Constellation, and his first step was to carry out a major review of Constellation, which was the Augustine committee," Logsdon said. "Then a year later, a year after taking office, he made his big space policy decision. "I think it's entirely plausible that maybe the first task for the Space Council is to review the program as it now exists, make some recommendations with changes six or nine months down the line."